Big News — Twitter Co-founder Biz Stone backs Visit! Big News — Twitter Co-founder Biz Stone backs Visit! We are thrilled to announce that Visit has raised a new round of funding from a dream team of investors — Twitter Co-founder, Biz Stone; Blue Jeans Network Co-founder & CTO, Alagu Periyanann; Snapdeal Co-founders Kunal Bahl and Rohit Bansal; Karthee Madasamy, Former Managing Director Qualcomm Ventures India; Murugappa Group’s Muthu Murugappan. The investment will help us continue building out our Telemedicine App, including offering AI driven diagnosis to help us achieve our mission of democratising Healthcare. The team is honoured to work with Entrepreneurs who have inspired an entire generation for years. Visit was started in 2016 with a straightforward mission: to democratise Healthcare by solving the shortage of doctors. According to the WHO the world suffers from a shortage of at-least 7.2 million health-care workers. In India for every doctor there are 2000 patients lined up with in-clinic waiting time running in hours. This is hampering accessibility to quality health advice, creating an overwhelming problem in India. But we think we have a bright spot— an AI powered Chatbot for health advice learning from and assisting existing doctors. 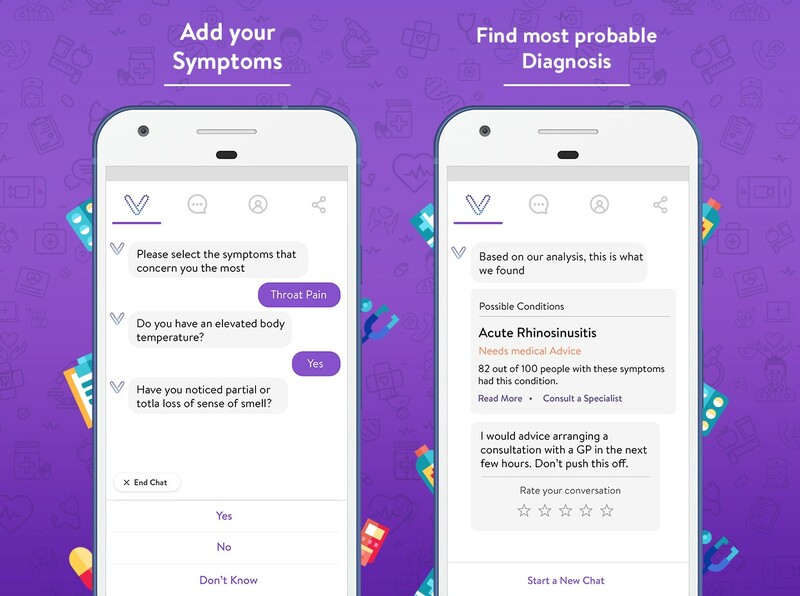 Users interact with the Visit Chatbot by adding their symptoms and the bot follows-up with a series of questions to predict the most probable diagnosis. The questions are generated by a ML model, trained using a knowledge base of probabilistic relationships (over 20,000) between variables such as conditions, symptoms, risk factors, past history etc. Once users know about the most probable medical condition affecting them, the Visit bot connects them with a pan-India network of over 2000 Specialists for a tele-consult over Video, Phone and Chat to get the right treatment plan. Users can stay in touch with their practitioners over chat for follow-ups upto 7 days. The objective is not to replace the doctor, but to help practitioners in an assistive way by regular patient check-ins and reminders related to their care plan including — medication reminders, activity notifications, prescription re-fills etc. This is also one of the cornerstones of our model — creating a symbiotic relationship between AI and doctors to create a big impact for patients. Over the past year we have been fortunate to get a lot of user love. Visit has received over 200,000 chat conversations and handles about 1500 daily chat queries ranging from general health, medicines, skin problems, diet/nutrition and gynaecology. The average user conversation on Visit lasts 8.5 minutes and the app is rated 4.7/5 on the Play Store. Some of India’s top employers and Health Insurances — Times Group, Rolls Royce, HDFC AMC, Wipro CCLG, Religare Health Insurance work with Visit to make the platform available to their employees and susbcribers as a health benefit. The excitement around the App and the Chatbot has been overwhelming! So what next? Visit aims to reach a million more users in 2018 and become the go to app for quality health advice. Our knowledge base improves as more users query their symptoms making our ML models and app better for the new users coming in. We will continue to execute on our roadmap aggressively to create a world where health-care access is readily available anytime, anywhere, to all sections of our society. For this, we need great people on the team. If you are someone who is passionate about applying technology to amplify the best traits of humanity and would like to work with us please feel free to send a mail to hello@getvisitapp.com. You can learn more about Visit and our team on our website.